“I have cancer.” It took me a while to say those words out loud. But for three years now, I've been living with cancer. November 9, 2015 to be exact. That's the day it was staged and named, Non-Hodgkin’s Follicular Lymphoma. Like many, I felt a little blindsided. A lingering cough followed by some shortness of breath brought me to the doctor. I suspected bronchitis or maybe pneumonia. Well, it was pneumonia, anemia, and NHFL. That's the day this new life began. I did my chemo treatments and I instantly started feeling better. The cough left and I could breathe comfortably. Six months of treatments and a PET scan showed "good response to treatment" the best news! But a little something else popped up ..."verify clinically.” After some procrastination, I did just that, and wham! Another cancer hit, endometrial adenocarcinoma on November 18, 2016, almost exactly one year from diagnosis #1. I now had two cancers! I feel fortunate that surgery removed cancer #2. I will follow up with doctor often and in five years I can say I'm cured of this one. Two years down, just three to go. But my Lymphoma, that's a different story, as of today, my stage 4 blood cancer is considered incurable, but manageable. So that's what I'm doing, managing my new life with cancer. In February of 2018 ... I felt off, saw my doctor, and yes the Lymphoma had returned. A mere 23 months later. But this time treatment was much easier, you see this cancer was a wakeup call for me. I have been focusing on getting stronger, healthier, and preparing for the inevitable. It only took three rounds of chemo to beat it this time. 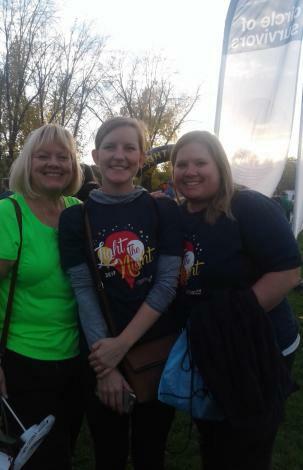 Last year, I became involved with LLS's Light the Night Walk. In a cyber world of scary and often confusing information, LLS became my source for accurate information on my cancer, as well as the amazing strides being made with regards to developing treatment options and trials. Supporting this amazing group was the next step in my cancer story. Giving back, fighting for those too weak to fight and it is empowering knowing that my little contribution could help to someday alter my own treatment. I have cancer. I'm ok saying that now because I understand that my cancer story could potentially help others. I also now feel the tentacles of support reaching far beyond what I could imagine three years ago. My hope? That I get to change my story. My new story begins & ends with ... I HAD Cancer.